This screw cap is a perfect size for a milk jug. 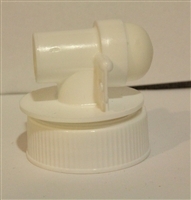 Screw top and made of plastic this caps hole fits a fermentation lock. Sanitize your barrels with Sulfur Disks.